It's stories like theirs that make this business personally rewarding for all of our employees. 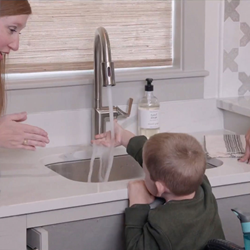 It was with great pride that MR Direct received the news that one of its stainless steel sinks was installed during a recent episode of Fixer Upper. This popular television show on the HGTV network is hosted by Chip and Joanna Gaines, who own and operate a home remodeling and design business known as Magnolia Homes. For this makeover, Chip and Joanna teamed up with celebrity, Tim Tebow, to accomplish a very emotional transformation for a family in need. The episode features the Copp family of four. Melissa and Jody are the proud parents of two sons, Calan (9) and Lawson (5). Both boys have an extremely rare and life-threatening genetic condition that has rendered them wheelchair-bound for life. Previously, the Copp family was living in a modest apartment with little-to-no accommodation for the disabled. The Tim Tebow Foundation learned of this family’s hardships and approached Magnolia Homes for a partnership. The rest of the story unfolded on the January 30th showing of Fixer Upper. The home that was chosen for the Copp family was gutted by the previous owners, so Chip and Joanna had the opportunity to design the features and layout from scratch. The goal was to make the house completely ADA-compliant, and 100% accessible to the boys in their wheelchairs. The changes that were made to the home were simple, yet impactful. Hallways and walk spaces were widened to allow free mobility of the wheelchairs. Cumbersome porch steps were replaced by a subtly-rising slope. The microwave was custom-fitted into a lower cabinet that the boys can reach. And the MR Direct ADA2318 was installed as a roll-under sink in the kitchen. This sink has a shallow depth, which gives Calan and Lawson the freedom to work alongside their parents to help prepare meals. This episode will air again March 6, at 6:00pm and March 31, at 7:00pm, on HGTV. You will certainly be touched by the Copp family, and the genuine actions of Chip and Joanna Gaines, and Tim Tebow.